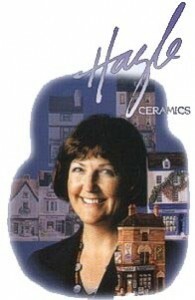 Hazle Ceramics was formed in 1990 by Hazle Boyles, who at the time designed, painted and produced all the ceramics herself. Since then the company has grown substantially, now selling its ceramics to many enthusiastic collectors worldwide. The main collection ‘A Nation of Shopkeepers’ takes its name from the famous Napoleon quote. Hazle took the statement as a compliment to the kind of liveliness and endeavour that can be found in the British High Street, with its hotchpotch of architectural styles and bustling activity, and has produced a range of low relief miniatures that reflect many different periods of British Architecture and History: Edwardian, Victorian, Georgian, Elizabethan and Tudor. The range has received the British Giftware Association Award for the ‘Best Collectible’ for its ‘originality and value’. Designer and Company owner, Hazle owes her love of British architecture partly to her upbringing in Canada. On her return to the UK at the age of 16 she was fascinated by the myriad of small shops she discovered in the East End of London where she stayed. It was the antithesis of Canada where an abundance of space led to low level sprawling shopping malls. The High Street at that time was the centre of British commercial and social life – shopping trolleys, fridge freezers and the idea of travelling several miles to do the basic shopping had not begun. Hazle studied Interior Design in the North East of England, followed by a PGCE in Yorkshire. Her employed career included designing for the Museum’s Service and working for a printing company in Oxfordshire, but mainly as a teacher of Art and Craft Design & Technology in Hertfordshire and Essex. At the same time she started some freelance design work, and as a hobby created low-relief ‘clay pictures’ which gradually moved from landscapes and people to feature more and more buildings. When she had enough material she mounted an exhibition at the Oxfordshire County Museum at Woodstock, who bought some of her pieces for their permanent exhibition. With developments in the educational system and her move to Head of Department, Hazle had less and less time for her own creative outlet. Eventually something had to give, and after a long process of matching her creative talents to a business setting and deciding what aspects of her personal work could be marketed, she eventually took the plunge, left teaching at the end of 1989 and set up what is today, Hazle Ceramics. Hazle’s love of the High Street was not only for the love of the shops but also the interaction of people with them. This is reflected in many of the ceramics, such as the Fish & Chip Shop with it’s ‘Friday night queue’ Sally Lunn’s House with all the history surrounding it; similarly the special Collector’s piece, Anne Frank’s House (now retired) which remembers a sad time on our history, and the Thomas Cook building, commemorating the first travel agent.